Ask fellow campers about "Delaware County Fairgrounds" and nearby attractions. As I belong to a camping group we stay here often, which is too bad. The fairground does not keep up with the needs of RVers. The electric is bad, you are parking on grass and if wet, you will sink down. The location of the dump station is very poor at best. This area is more for groups, however an upgrade to the area needs to be done. We camped at Delaware County Fairgrounds in a Fifth Wheel. We were unable to stay but briefly due to extreme rainfalls, so unsure the actual pricing. Garmin incorrectly wanted us to make a left turn on Acer which is actually a right turn. If you watch for the fairgrounds sign you should be okay. Trees at the entrance were a bit tight for a big rig. Close to town and not far from Hwy. 20. Grass sites with a very limited number of FHU's but they get afternoon shade. Extreme rains made the ground too soft for our big rig but others were there without problems. Local roads were being closed due to flooding. There are lots of primitive sites as well, but we did not get a price. Under normal conditions we would stay again. 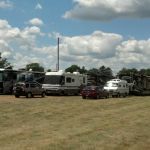 We camped at Delaware County Fairgrounds in a Motorhome. Are you affiliated with Delaware County Fairgrounds ?